Hide this Dealer (Vibgyor Property Consultants & Engineers)Discover properties by other dealers by hiding those whom you have already spoken to. You won't see them in your searches further but you can unhide anytime later. Hide this Dealer (PROPBULLS REALTY)Discover properties by other dealers by hiding those whom you have already spoken to. You won't see them in your searches further but you can unhide anytime later. Hide this Dealer (GROWTH INDIA BUILDTECH PRIVATE LIMITED)Discover properties by other dealers by hiding those whom you have already spoken to. You won't see them in your searches further but you can unhide anytime later. Hide this Dealer (Vishesh Propmart Noida)Discover properties by other dealers by hiding those whom you have already spoken to. You won't see them in your searches further but you can unhide anytime later. Hide this Dealer (Hind Properties)Discover properties by other dealers by hiding those whom you have already spoken to. You won't see them in your searches further but you can unhide anytime later. Hide this Dealer (Pawan Kumar) Discover properties by other dealers by hiding those whom you have already spoken to. You won't see them in your searches further but you can unhide anytime later. Hide this Dealer (Monali Nayak) Discover properties by other dealers by hiding those whom you have already spoken to. You won't see them in your searches further but you can unhide anytime later. Hide this Dealer (Deepak Jain) Discover properties by other dealers by hiding those whom you have already spoken to. You won't see them in your searches further but you can unhide anytime later. Hide this Dealer (Rajhans) Discover properties by other dealers by hiding those whom you have already spoken to. You won't see them in your searches further but you can unhide anytime later. JM Housing has come up with its new project JM Orchid in the suburbs of Noida in Sector76. JM Orchid is intended to deliver a holistic urban standard of living. It offers 2BHK, 2.5BHK, 3BHK, 3.5BHK apartments and commercial shops of superior designs which are conceptualized to provide luxury niceties to its occupants. This project has been designed by wellqualified architects who have crafted the structure of the building to be in a wonderful shape. JM Orchid is situated at the sector 76 in Noida, which is acknowledged as very luxurious localities of the city. Sector76 is considered as one of the highlighted residential localities of this zone as it has gained a lot of popularity in the recent time owing to the residential colonies and the evergrowing infrastructural development. Seeing this trend, developers have come up with their exclusive residential projects which are conceptualized to meet the needs of the potential homebuyers. JM Housing Construction business from last 25 years, were amongst pioneers in development and construction business in Delhi NCR and are visionaries. From location to planning, design and execution the efficient and competent team at JM Housing seeks to fulfill every need of its customers within the decided timeframe competently and efficiently. Dedicated and experienced this team is committed to carrying out the most diverse and difficult tasks on time and converting every customer's wish into reality. In which area is JM Orchid located?The project is situated in Sector-76, Noida. What is available flat size in JM Orchid? Flat sizes in the project range from 963.0 sqft to 1762.0 sqft. What is the 2 bedroom size in JM Orchid? 2 BHK units in the project are available in a size of 963.0 sqft to 1147.0 sqft. 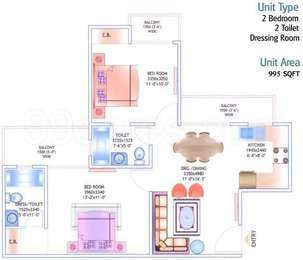 What is size of 3 bhk in JM Orchid? The area of 3 BHK apartments ranges from 1472.0 sqft to 1762.0 sqft. How much is the total size of JM Orchid?The project is spread over an area of 5.0 Acres. 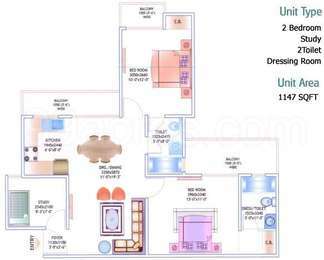 What is price of 2 bhk in JM Orchid? 2 BHK apartments in the project are available at a price of Rs. 6100000 to Rs. 7500000. JM Housing Construction business from last 25 years, were amongst pioneers in development and construction business in Delhi NCR, and are visionaries. From location to planning, design and execution the efficient and competent team at JM Housing seeks to fulfill every need of its customers within the decided timeframe competently and efficiently. Dedicated and experienced this team is committed to carrying out the most diverse and difficult tasks on time and converting every customer's wish into reality. My father is willing to invest his retirement GPF of Rs. 1 crore in real estate. Would investment in JM Orchid project be a good option? What kind of returns can I expect? Please suggest some other options in and around this location? Hi, JM Orchid have seen significant price appreciation since its launch in 2014. With poor construction quality and prevailing seepage issues, it may not be a good investment option. Hi Birju, investment in JM Orchid would be worthwhile. The property prices here have grown exponentially by over 100% since its launch in 2010. The current rates @ 5,000/sq.ft. are higher than the average locality rates [4,000 - 4,700] and the value is expected to appreciate strongly in the coming quarters, owing to the high demand and the excellent location of the project. Also, you can easily buy a flat in JM Orchid within your budget of Rs.1 crore. Other projects which you can explore are Prateek Wisteria [sector-77], Lotus Boulevard [sector-100], RWA Jalvayu Towers [sector-47], Omaxe Twin Tower [sector- 50]. I am planning to buy a flat in JM Orchid. Please help me with the ongoing rates. Also, since this is a 5 year old project, would the stamp duty charges vary as per the age of the building?